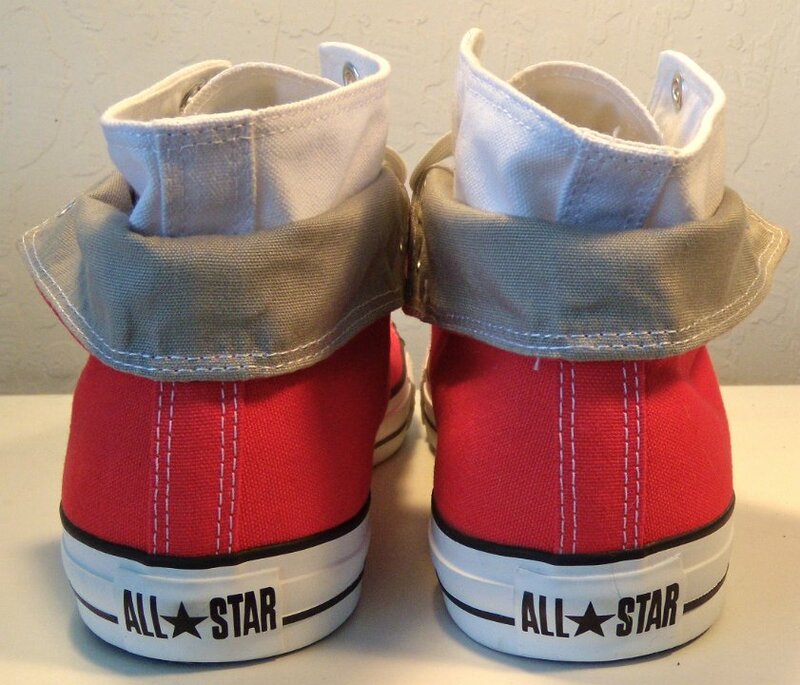 Photo gallery of red/white and dress blue/grey foldover double upper high top chucks. 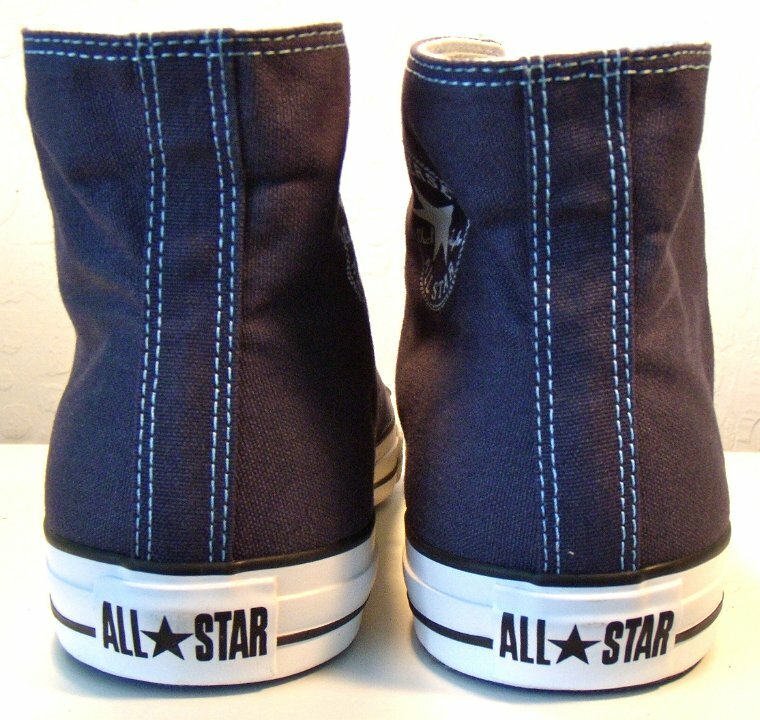 1 Foldover Double Upper High Top Chucks Inside patch view of a laced up right blue foldover double upper high top chuck. 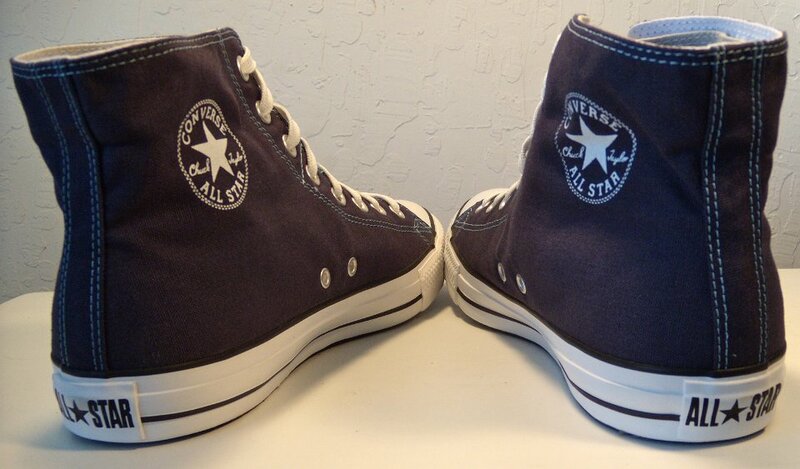 2 Foldover Double Upper High Top Chucks Outside view of a laced up right blue foldover double upper high top chuck. 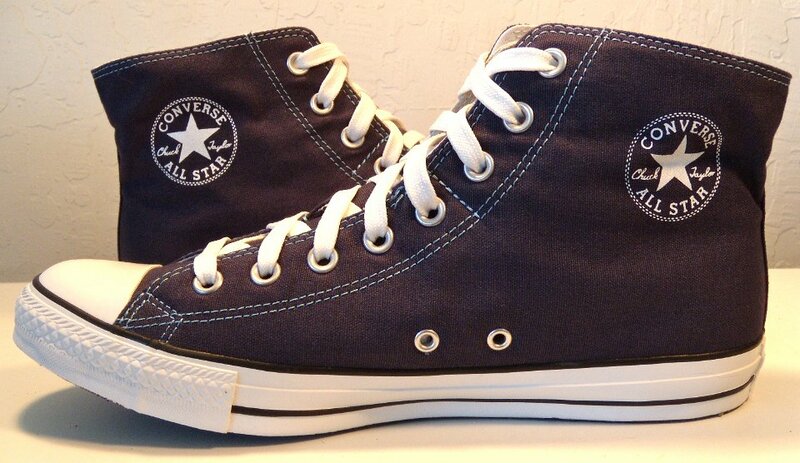 3 Foldover Double Upper High Top Chucks Inside patch view of a laced up left blue foldover double upper high top chuck. 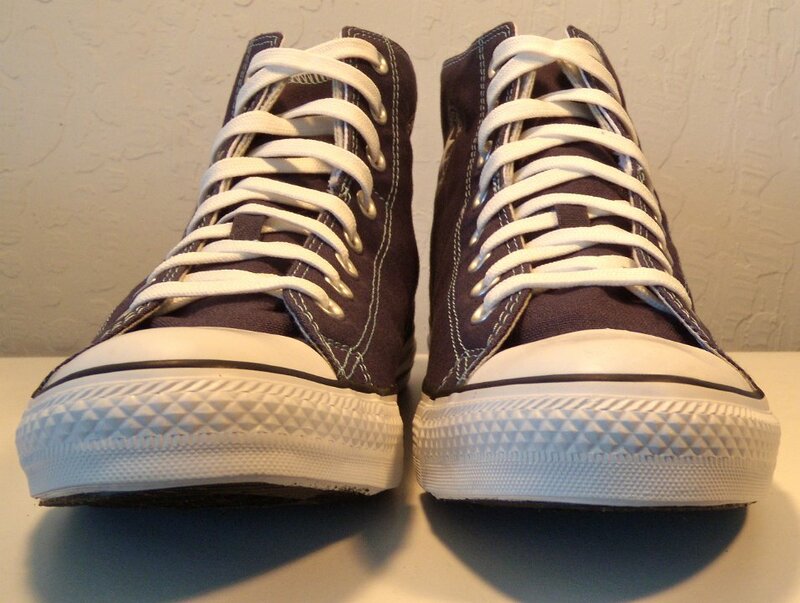 4 Foldover Double Upper High Top Chucks Outside view of a laced up left blue foldover double upper high top chuck. 5 Foldover Double Upper High Top Chucks Rear view of laced up blue foldover double upper high top chucks. 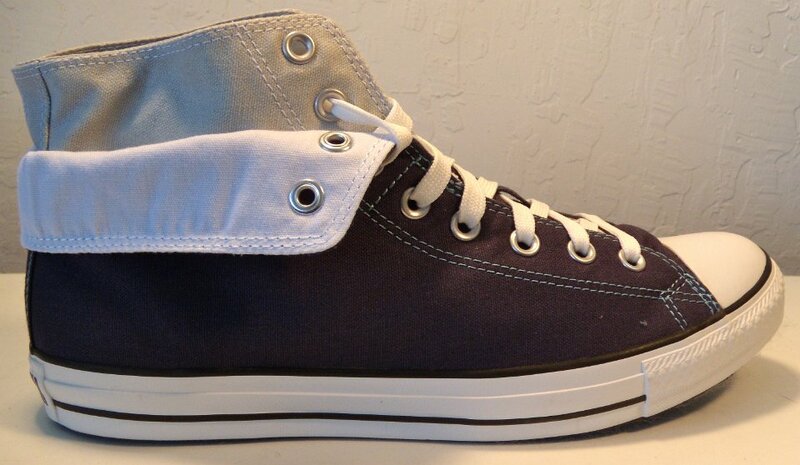 6 Foldover Double Upper High Top Chucks Angled rear view of laced up blue foldover double upper high top chucks. 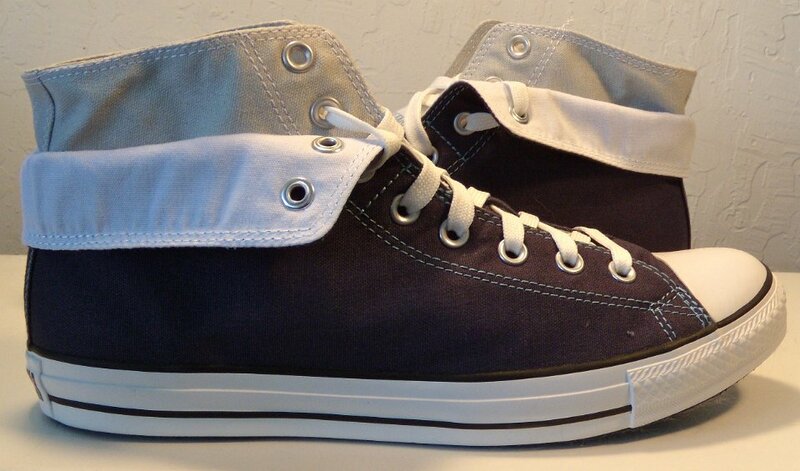 7 Foldover Double Upper High Top Chucks Angled side view of laced up blue foldover double upper high top chucks. 8 Foldover Double Upper High Top Chucks Front view of laced up blue foldover double upper high top chucks. 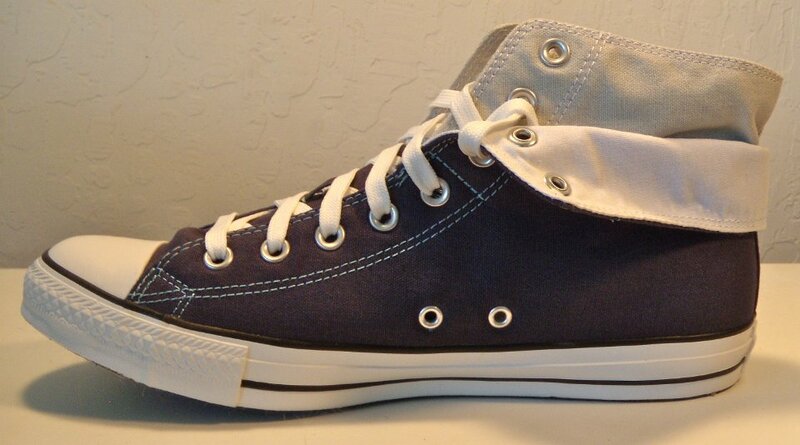 9 Foldover Double Upper High Top Chucks Angled front view of laced up blue foldover double upper high top chucks. 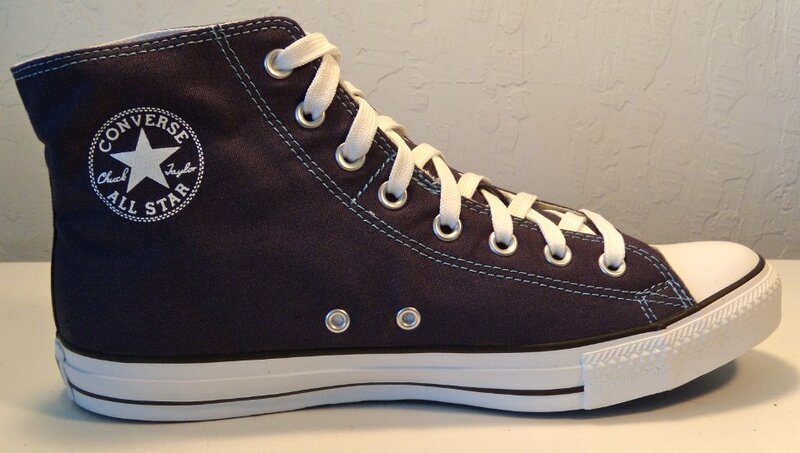 10 Foldover Double Upper High Top Chucks Top view of laced up blue foldover double upper high top chucks. 11 Foldover Double Upper High Top Chucks Closeup of the insole to a blue foldover double upper high top chuck. 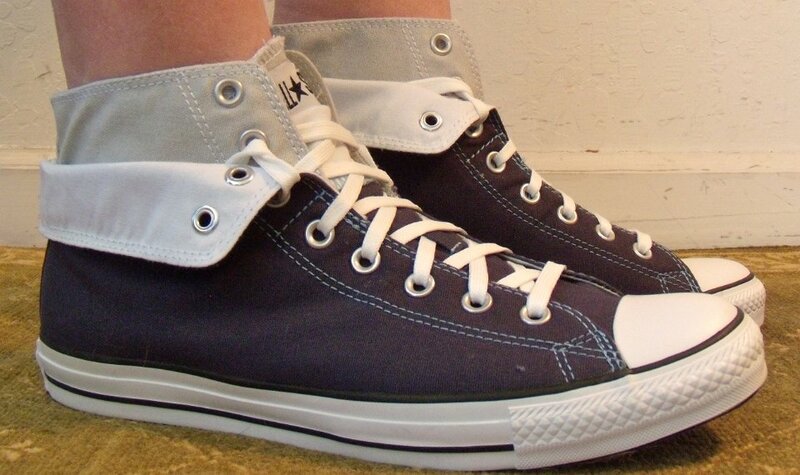 12 Foldover Double Upper High Top Chucks Inside patch views of laced up blue foldover double upper high top chucks. 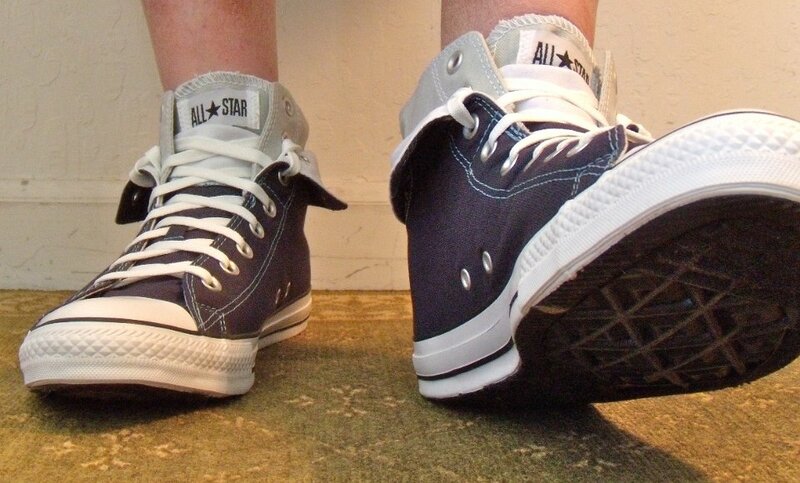 13 Foldover Double Upper High Top Chucks Outside views of laced up blue foldover double upper high top chucks. 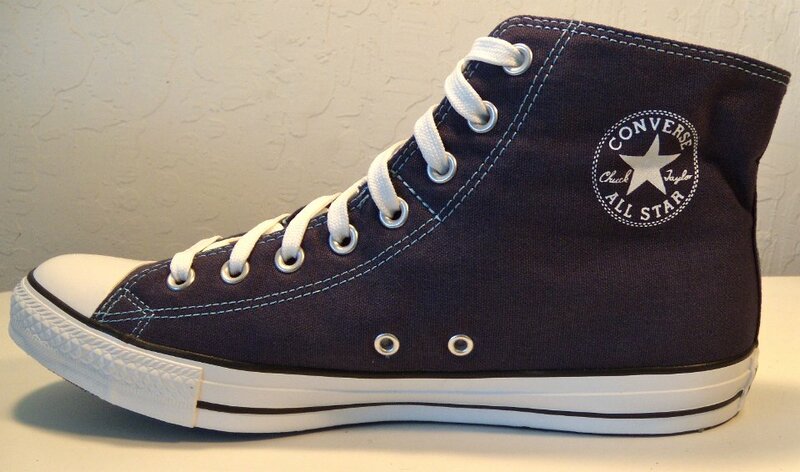 14 Foldover Double Upper High Top Chucks Inside patch and sole views of laced up blue foldover double upper high top chucks. 15 Foldover Double Upper High Top Chucks Inside patch view of a folded down right blue foldover double upper high top chuck. 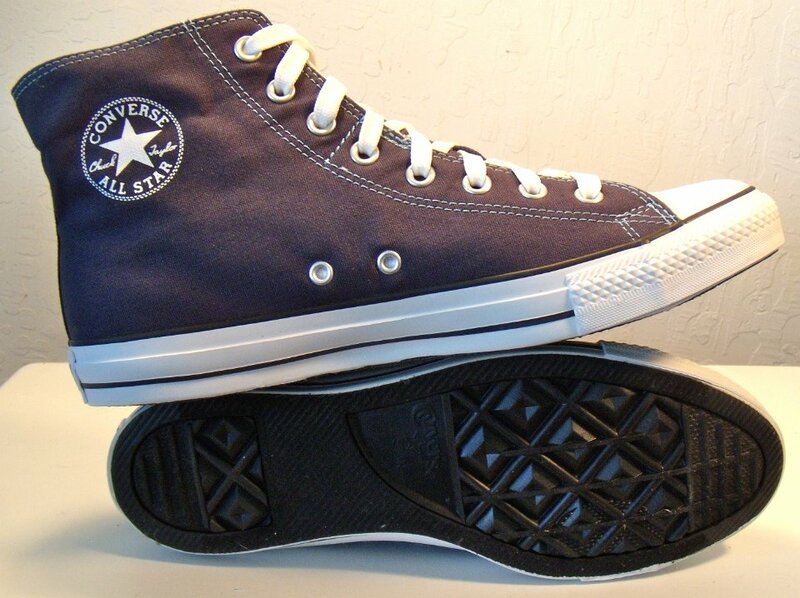 16 Foldover Double Upper High Top Chucks Outside view of a folded down right blue foldover double upper high top chuck. 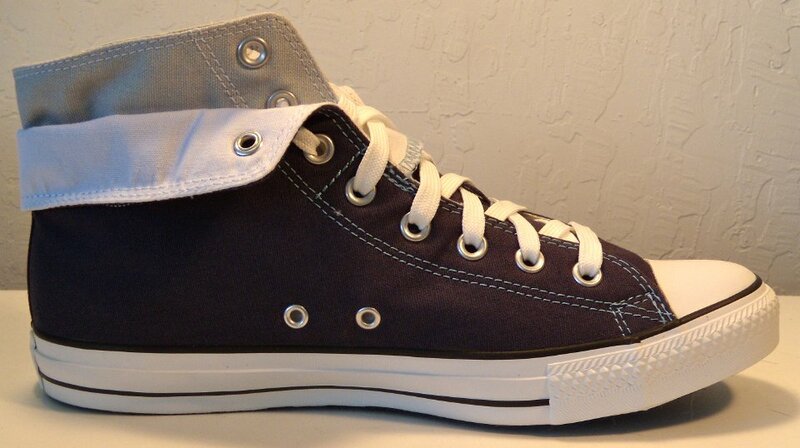 17 Foldover Double Upper High Top Chucks Top view of a folded down right blue foldover double upper high top chuck. 18 Foldover Double Upper High Top Chucks Inside patch view of a folded down left blue foldover double upper high top chuck. 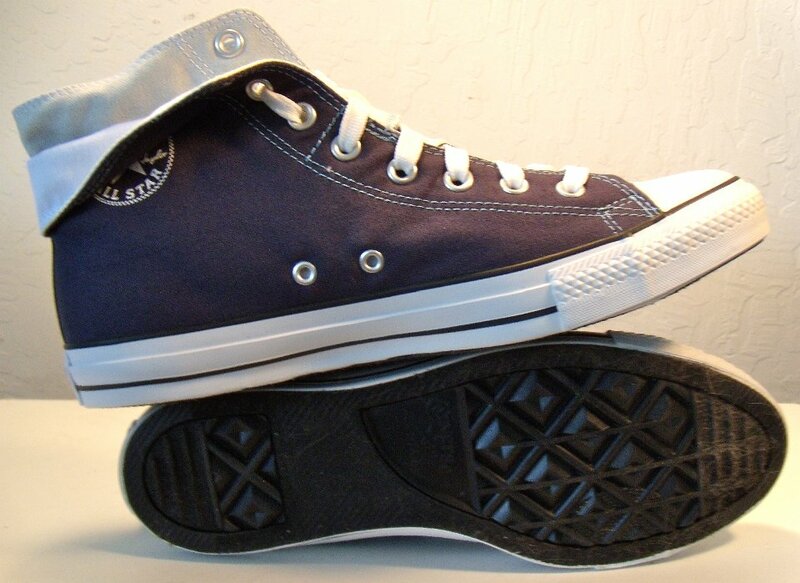 19 Foldover Double Upper High Top Chucks Outside view of a folded down left blue foldover double upper high top chuck. 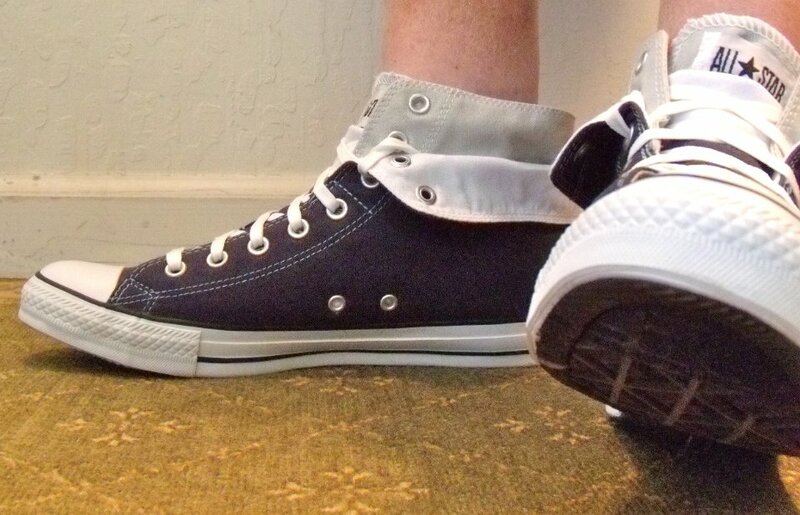 20 Foldover Double Upper High Top Chucks Top view of a folded down left blue foldover double upper high top chuck. 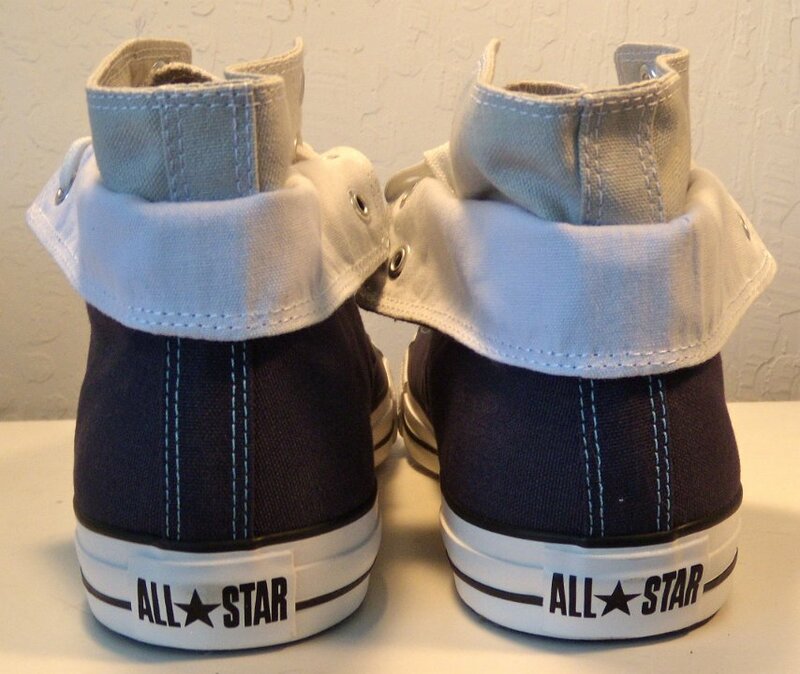 21 Foldover Double Upper High Top Chucks Rear view of folded down blue foldover double upper high top chucks. 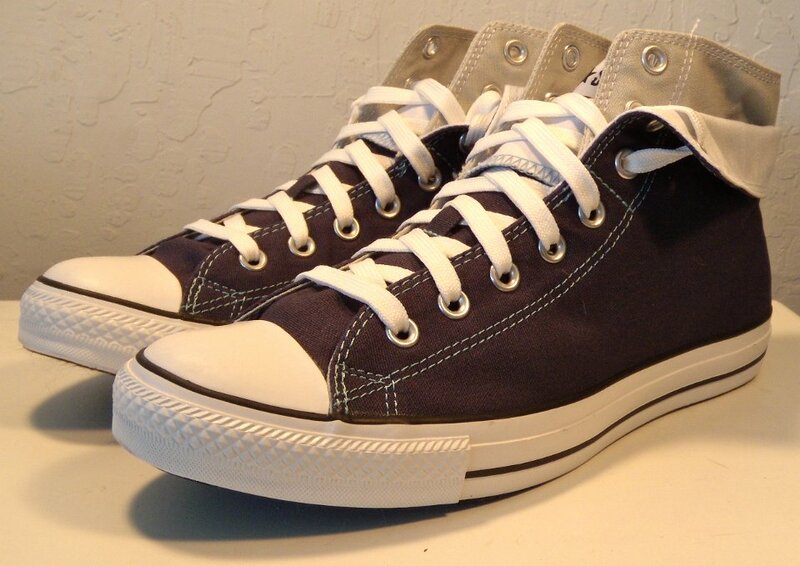 22 Foldover Double Upper High Top Chucks Angled rear view of folded down blue foldover double upper high top chucks. 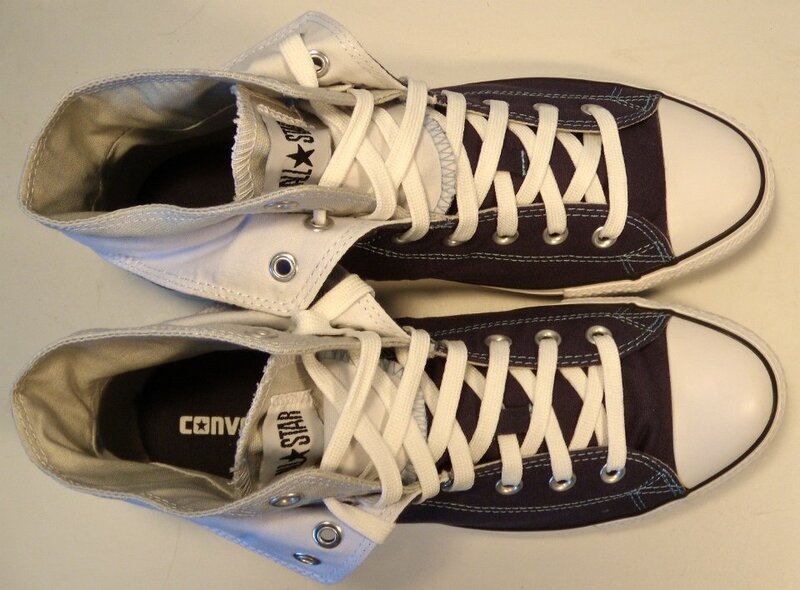 23 Foldover Double Upper High Top Chucks Angled side view of folded down blue foldover double upper high top chucks. 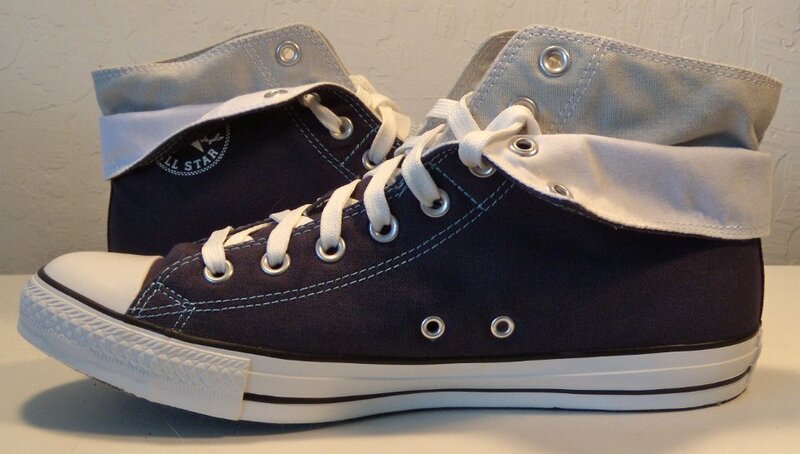 24 Foldover Double Upper High Top Chucks Front view of folded down blue foldover double upper high top chucks. 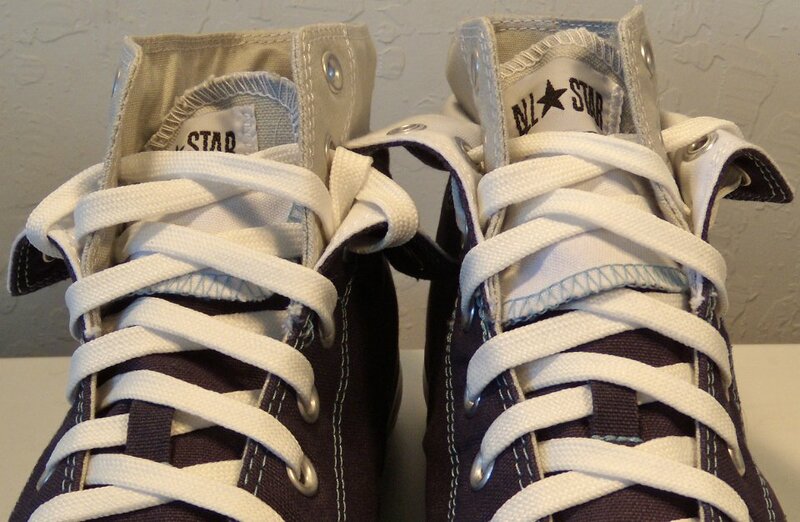 25 Foldover Double Upper High Top Chucks Closeup view of the All Star patch and shoelace slot on folded down blue foldover double upper high top chucks. 26 Foldover Double Upper High Top Chucks Top view of folded down blue foldover double upper high top chucks. 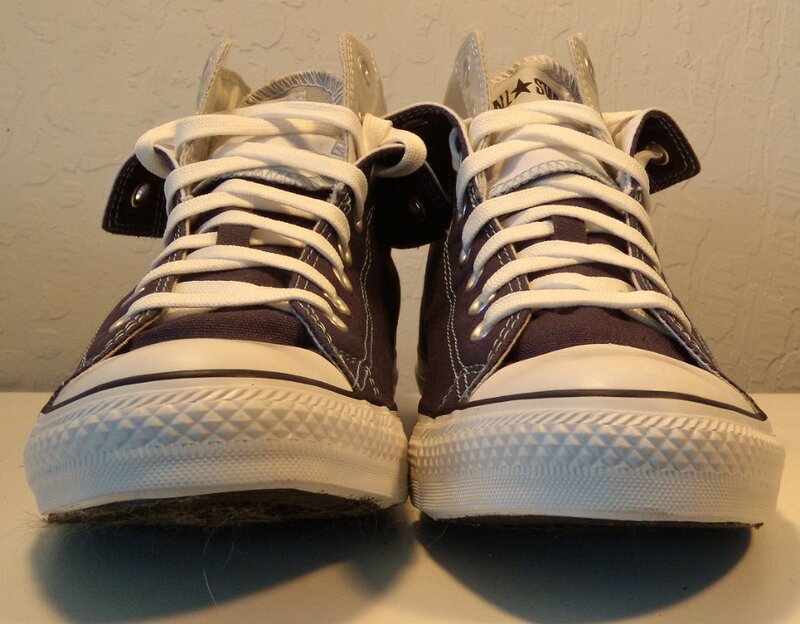 27 Foldover Double Upper High Top Chucks Inside patch views of folded down blue foldover double upper high top chucks. 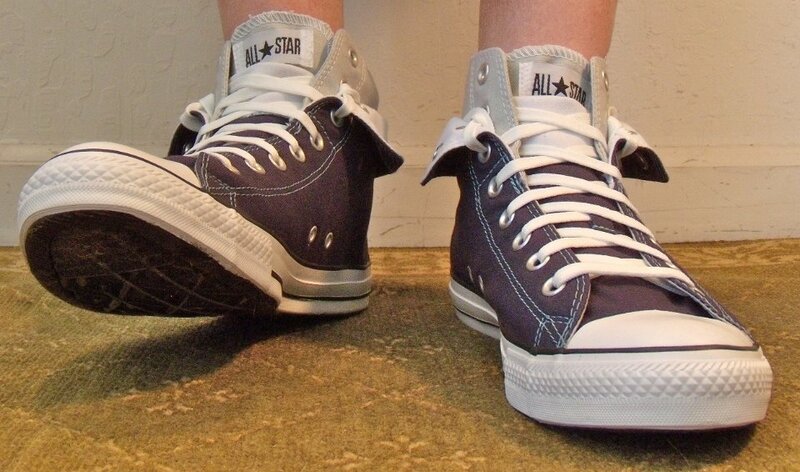 28 Foldover Double Upper High Top Chucks Outside views of folded down blue foldover double upper high top chucks. 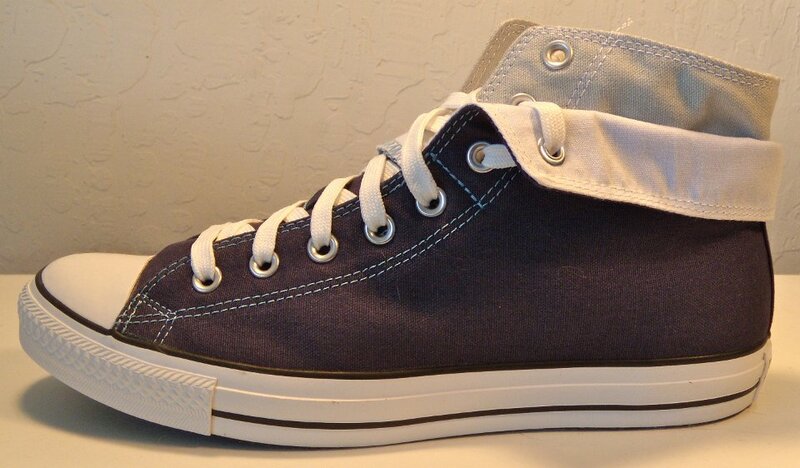 29 Foldover Double Upper High Top Chucks Inside patch and sole views of folded down blue foldover double upper high top chucks. 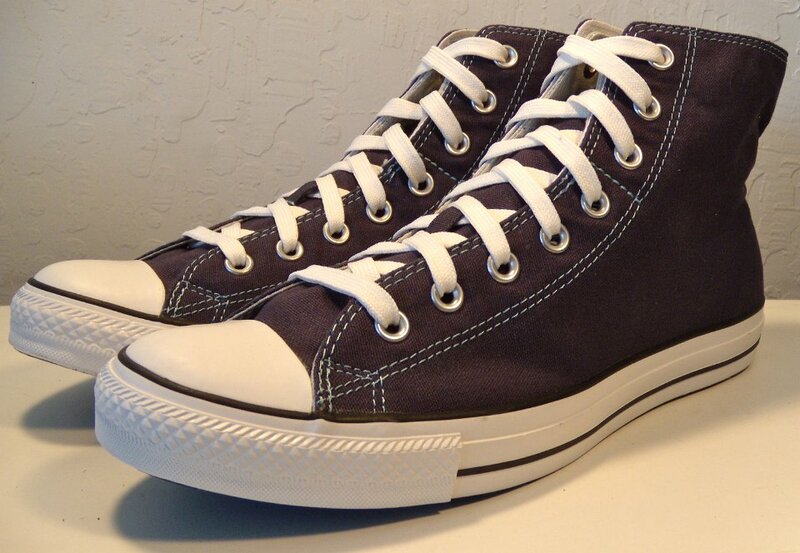 30 Foldover Double Upper High Top Chucks Wearing folded down blue foldover double upper high top chucks, front view. 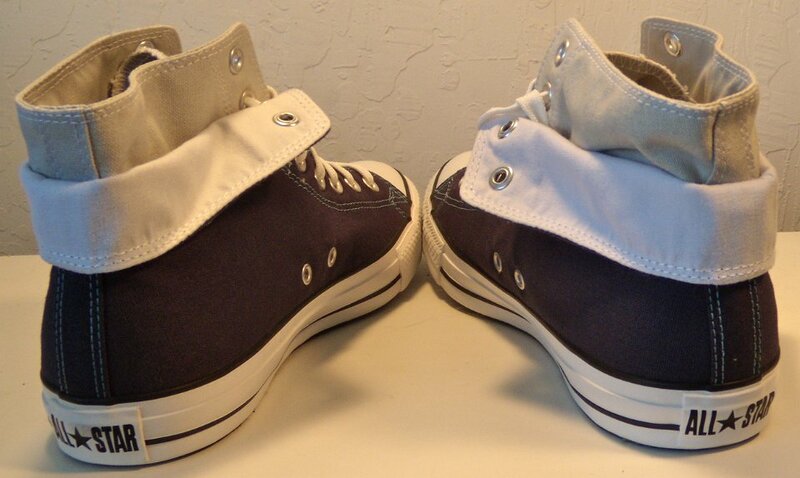 31 Foldover Double Upper High Top Chucks Wearing folded down blue foldover double upper high top chucks, front view 2. 32 Foldover Double Upper High Top Chucks Wearing folded down blue foldover double upper high top chucks, right side view. 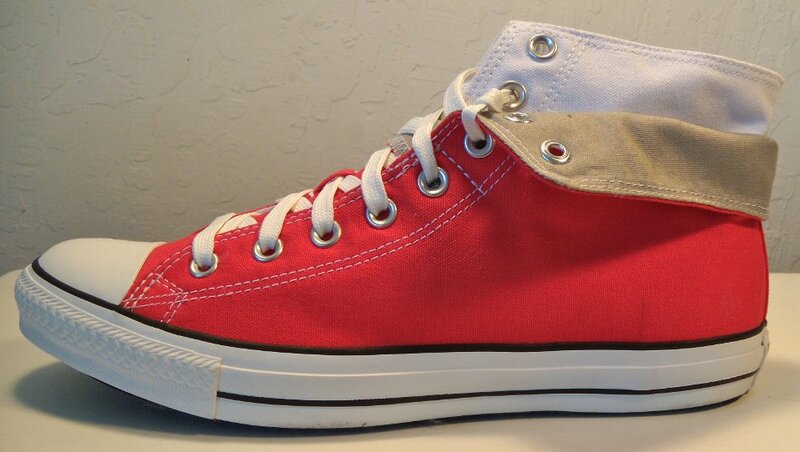 33 Foldover Double Upper High Top Chucks Wearing blue folded down red foldover double upper high top chucks, right side view. 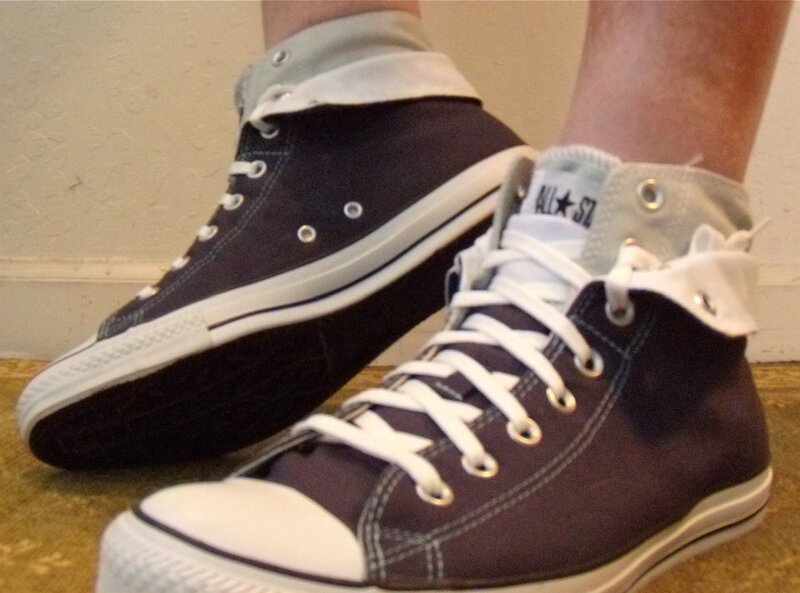 34 Foldover Double Upper High Top Chucks Wearing folded down blue foldover double upper high top chucks, rear view. 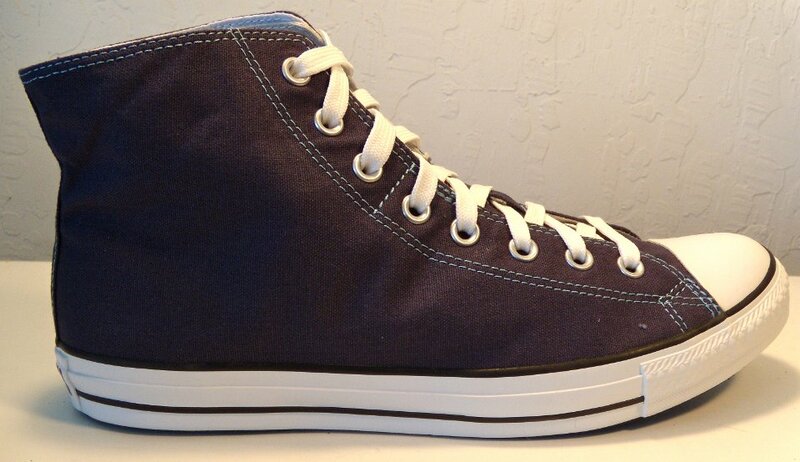 35 Foldover Double Upper High Top Chucks Wearing folded down blue foldover double upper high top chucks, rear view. 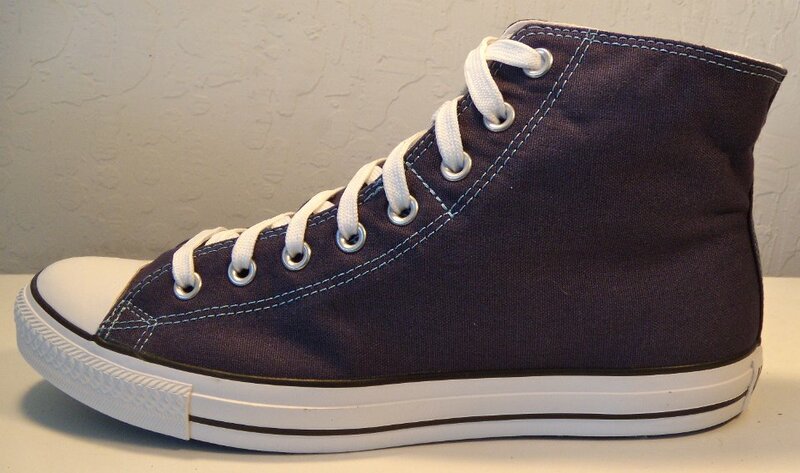 36 Foldover Double Upper High Top Chucks Wearing folded down blue foldover double upper high top chucks, left side view. 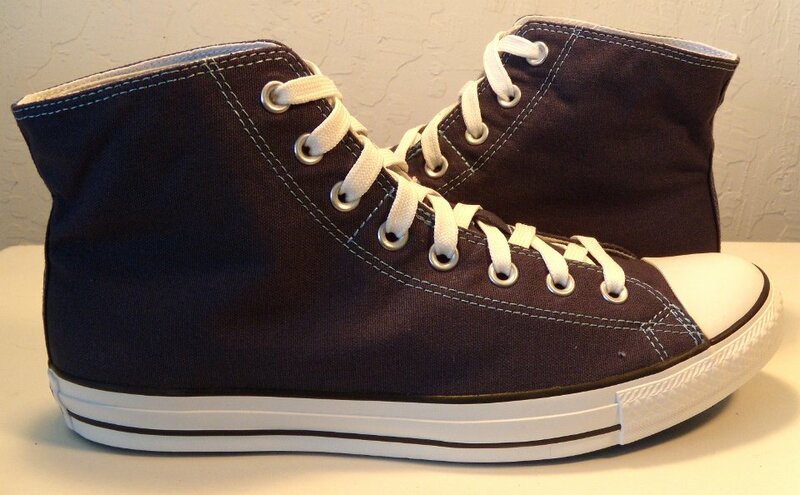 37 Foldover Double Upper High Top Chucks Wearing folded down blue foldover double upper high top chucks, left side view. 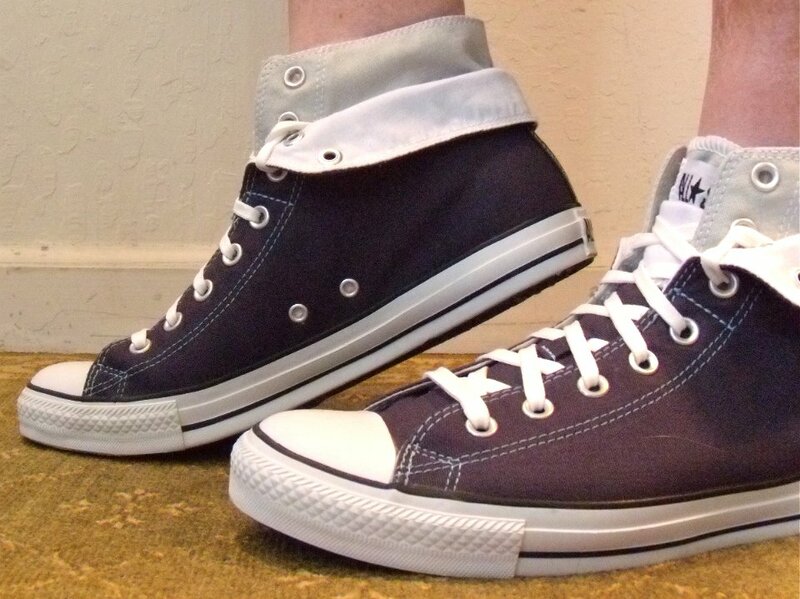 38 Foldover Double Upper High Top Chucks Wearing folded down blue foldover double upper high top chucks, left side view. 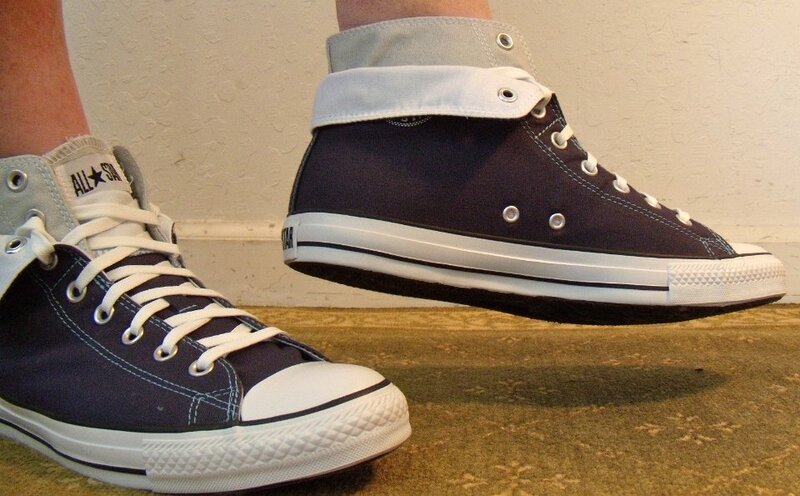 39 Foldover Double Upper High Top Chucks Wearing folded down blue foldover double upper high top chucks, angled left side view. 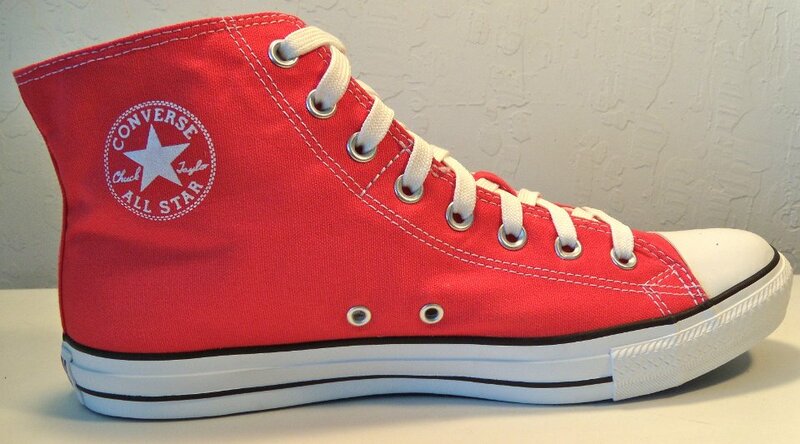 40 Foldover Double Upper High Top Chucks Inside patch view of a laced up right red foldover double upper high top chuck. 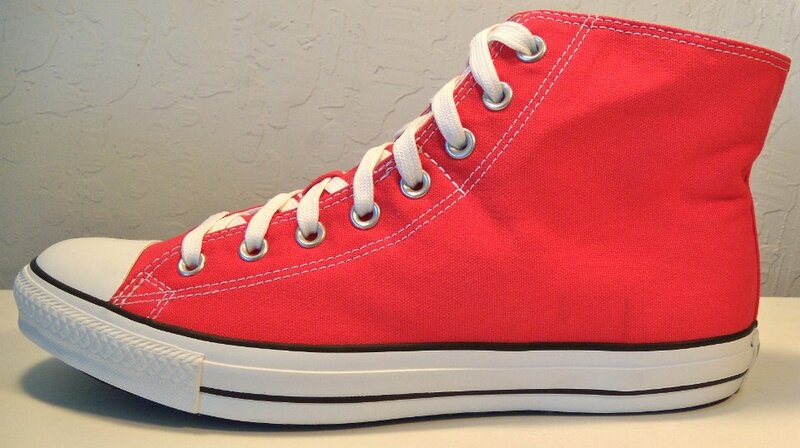 41 Foldover Double Upper High Top Chucks Outside view of a laced up right red foldover double upper high top chuck. 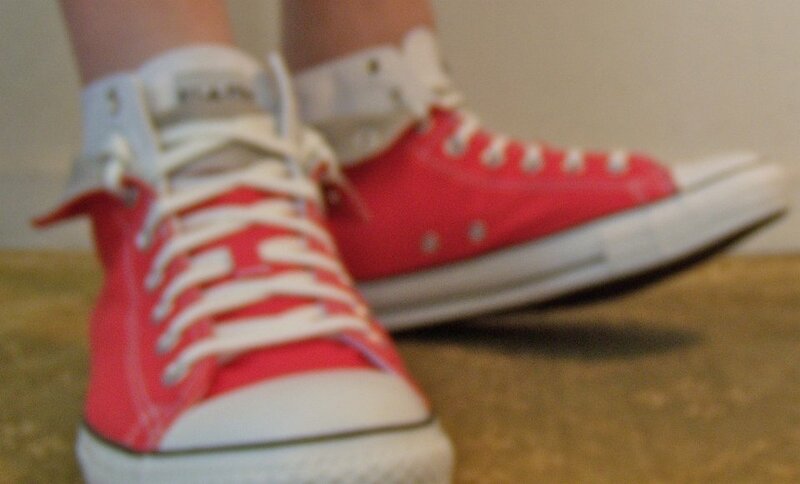 42 Foldover Double Upper High Top Chucks Inside patch view of a laced up left red foldover double upper high top chuck. 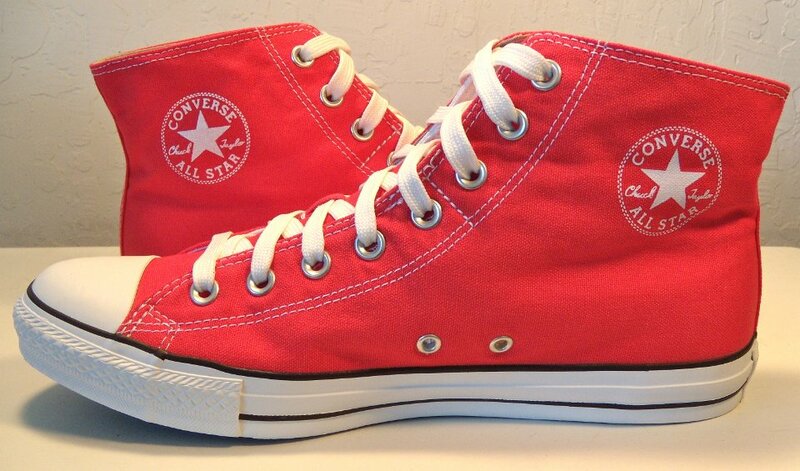 43 Foldover Double Upper High Top Chucks Outside view of a laced up left red foldover double upper high top chuck. 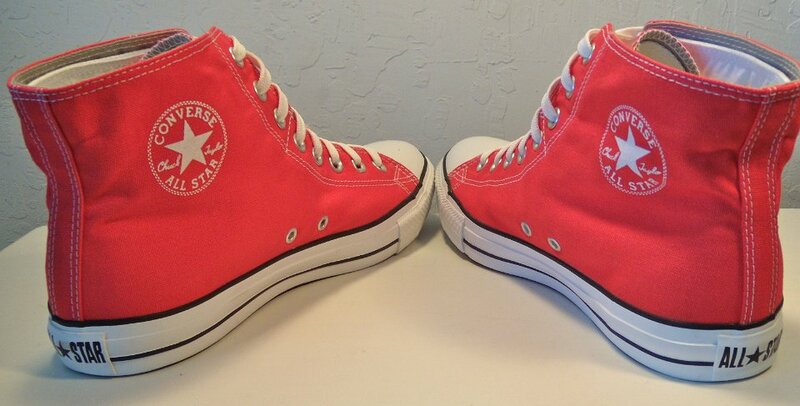 44 Foldover Double Upper High Top Chucks Rear view of laced up red foldover double upper high top chucks. 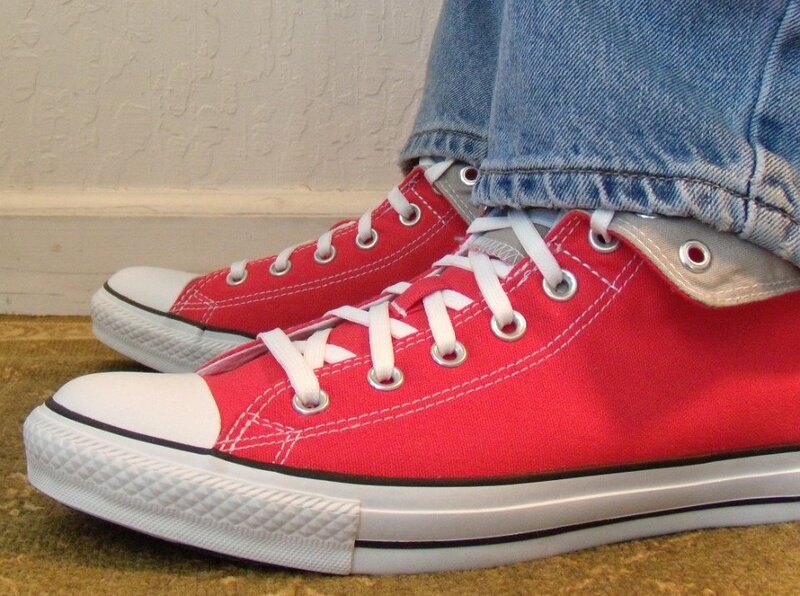 45 Foldover Double Upper High Top Chucks Angled rear view of laced up red foldover double upper high top chucks. 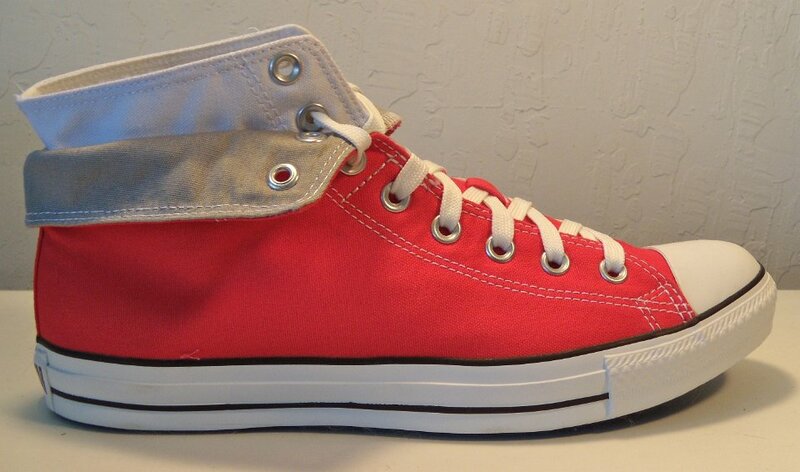 46 Foldover Double Upper High Top Chucks Angled side view of laced up red foldover double upper high top chucks. 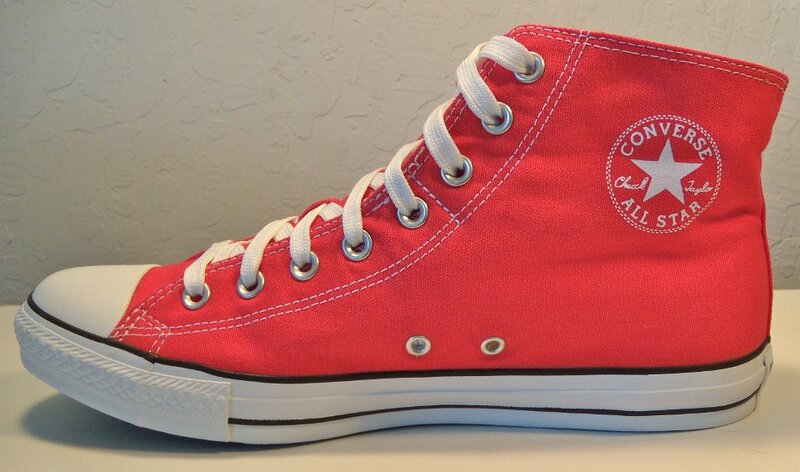 47 Foldover Double Upper High Top Chucks Front view of laced up red foldover double upper high top chucks. 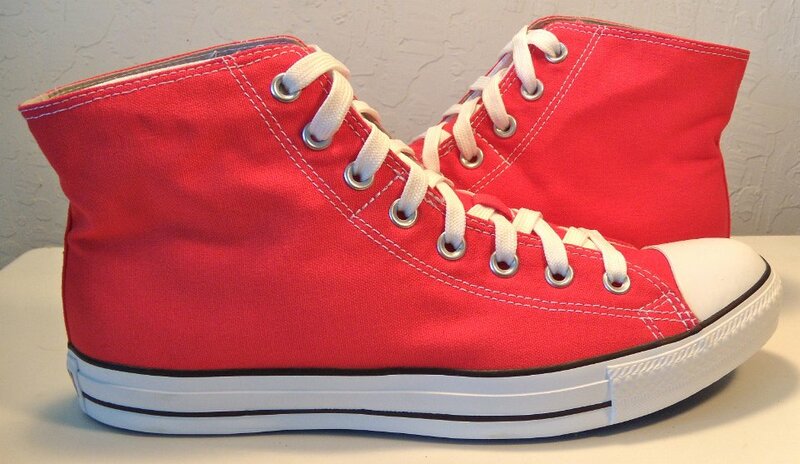 48 Foldover Double Upper High Top Chucks Angled front view of laced up red foldover double upper high top chucks. 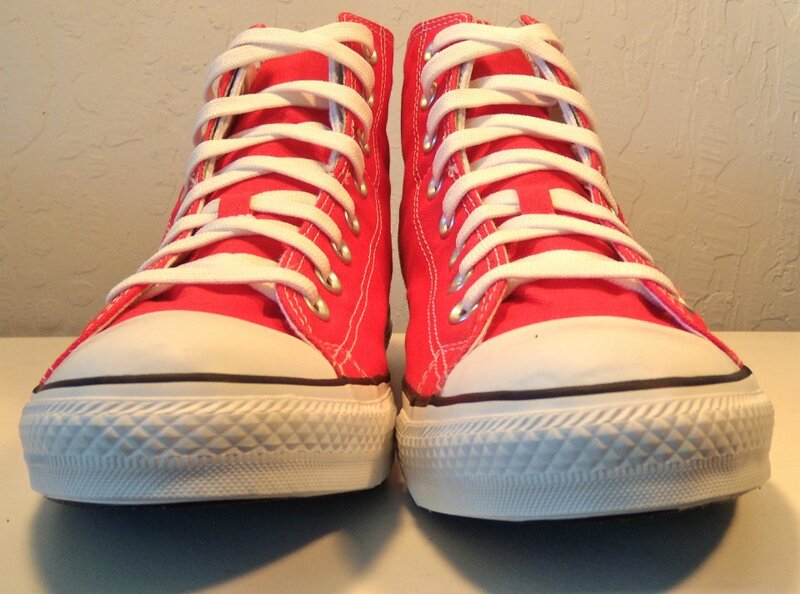 49 Foldover Double Upper High Top Chucks Top view of laced up red foldover double upper high top chucks. 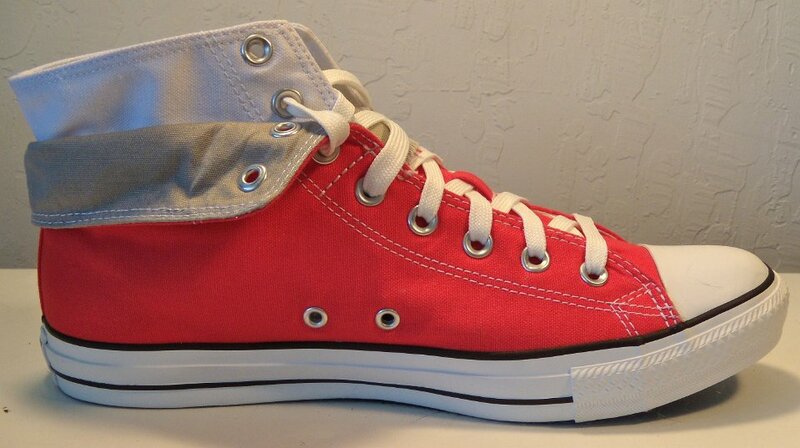 50 Foldover Double Upper High Top Chucks Inside patch views of laced up red foldover double upper high top chucks. 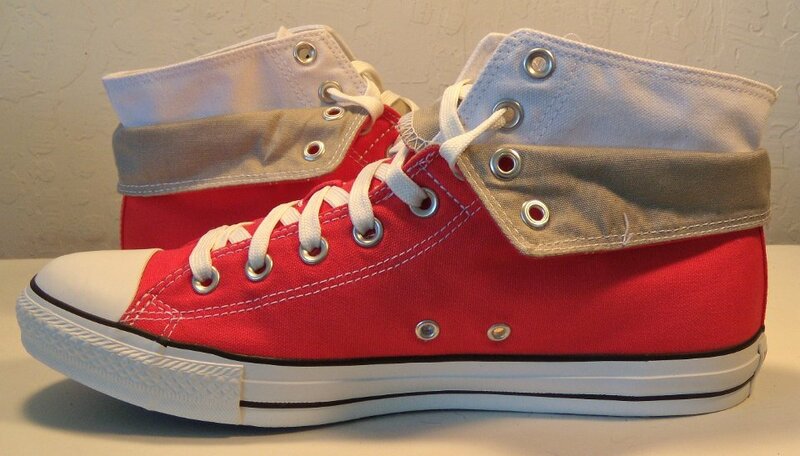 51 Foldover Double Upper High Top Chucks Outside views of laced up red foldover double upper high top chucks. 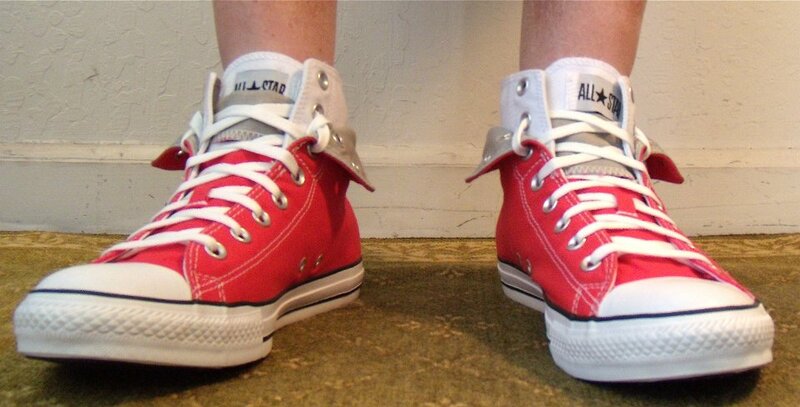 52 Foldover Double Upper High Top Chucks Inside patch and sole views of laced up red foldover double upper high top chucks. 53 Foldover Double Upper High Top Chucks Inside patch view of a folded down right red foldover double upper high top chuck. 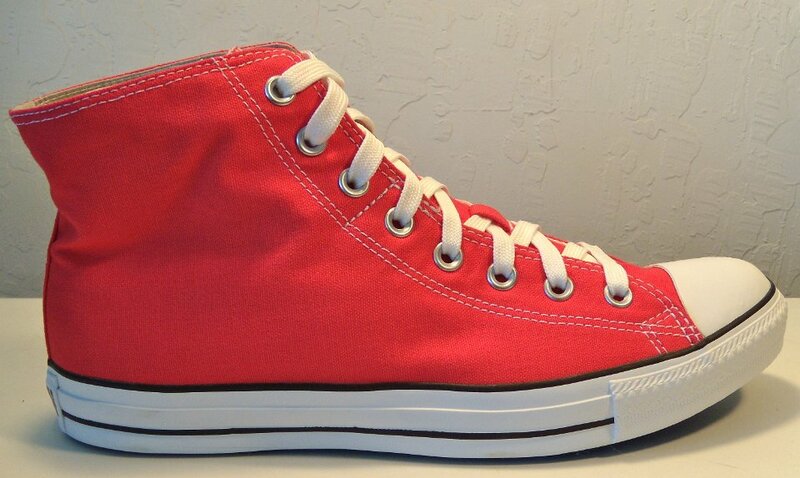 54 Foldover Double Upper High Top Chucks Outside view of a folded down right red foldover double upper high top chuck. 55 Foldover Double Upper High Top Chucks Top view of a folded down right red foldover double upper high top chuck. 56 Foldover Double Upper High Top Chucks Inside patch view of a folded down left red foldover double upper high top chuck. 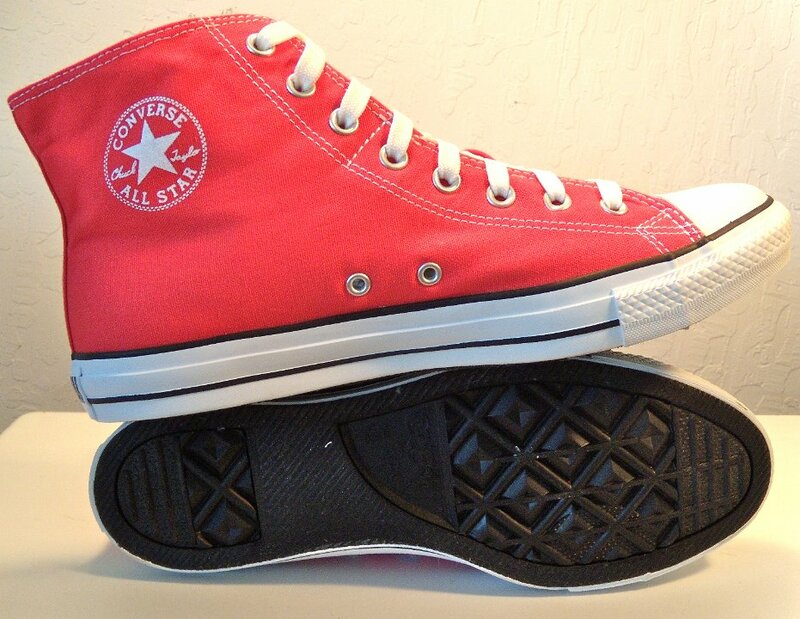 57 Foldover Double Upper High Top Chucks Outside view of a folded down left red foldover double upper high top chuck. 58 Foldover Double Upper High Top Chucks Top view of a folded down left red foldover double upper high top chuck. 59 Foldover Double Upper High Top Chucks Rear view of folded down red foldover double upper high top chucks. 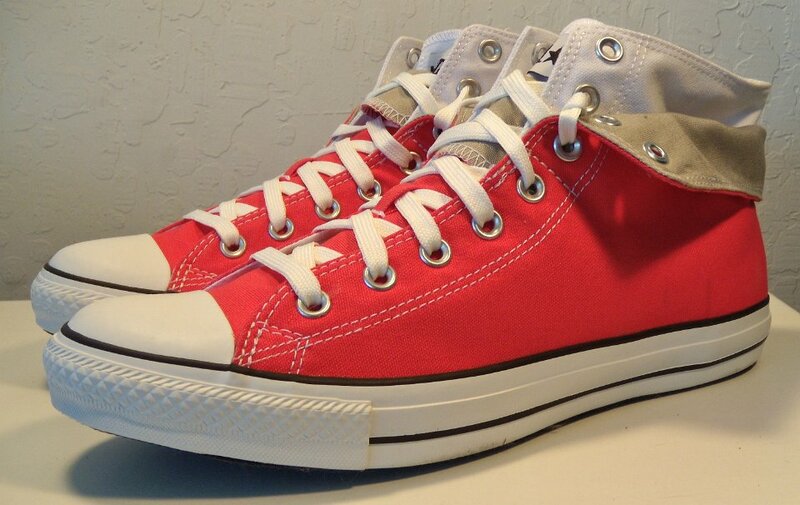 60 Foldover Double Upper High Top Chucks Angled rear view of folded down red foldover double upper high top chucks. 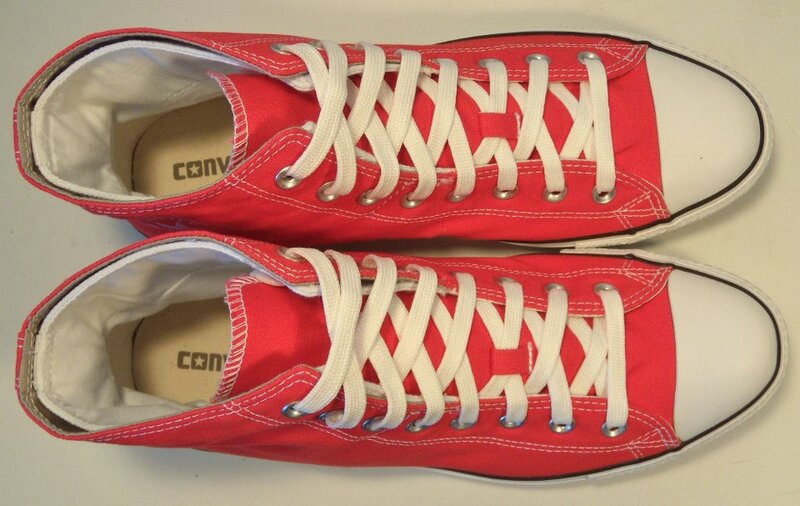 61 Foldover Double Upper High Top Chucks Angled side view of folded down red foldover double upper high top chucks. 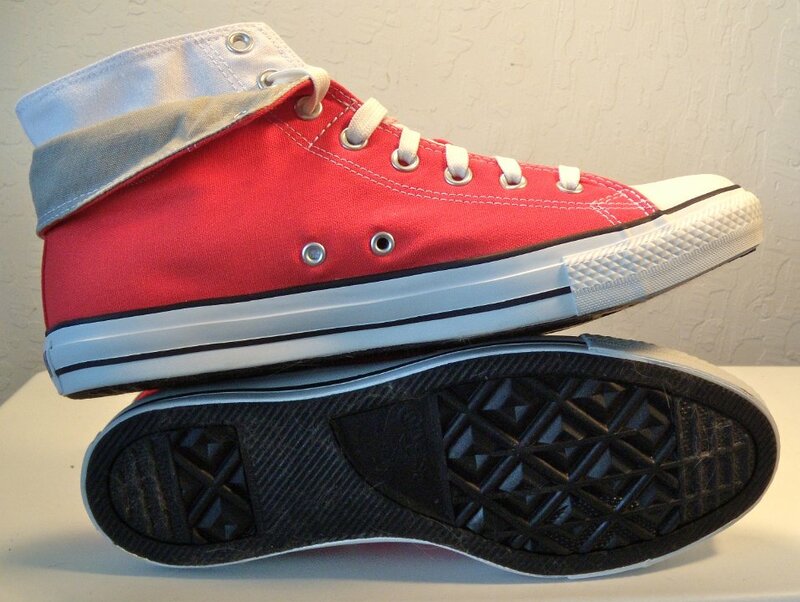 62 Foldover Double Upper High Top Chucks Front view of folded down red foldover double upper high top chucks. 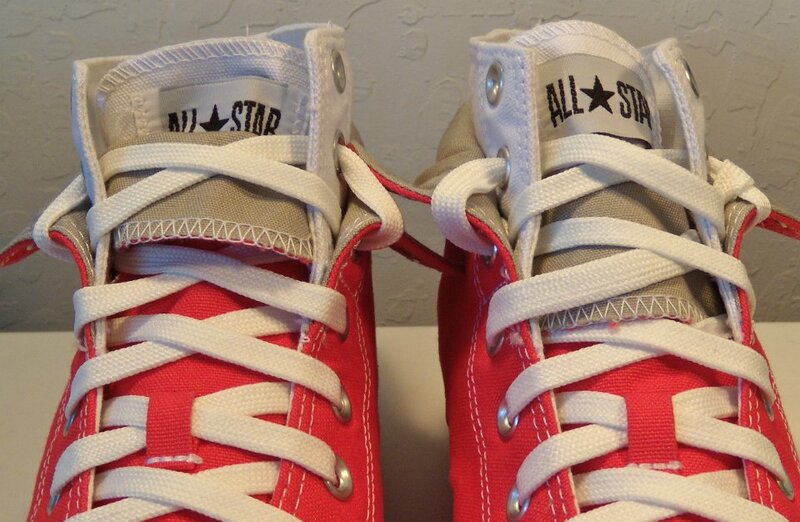 63 Foldover Double Upper High Top Chucks Closeup view of the All Star patch and shoelace slot on folded down red foldover double upper high top chucks. 64 Foldover Double Upper High Top Chucks Top view of folded down red foldover double upper high top chucks. 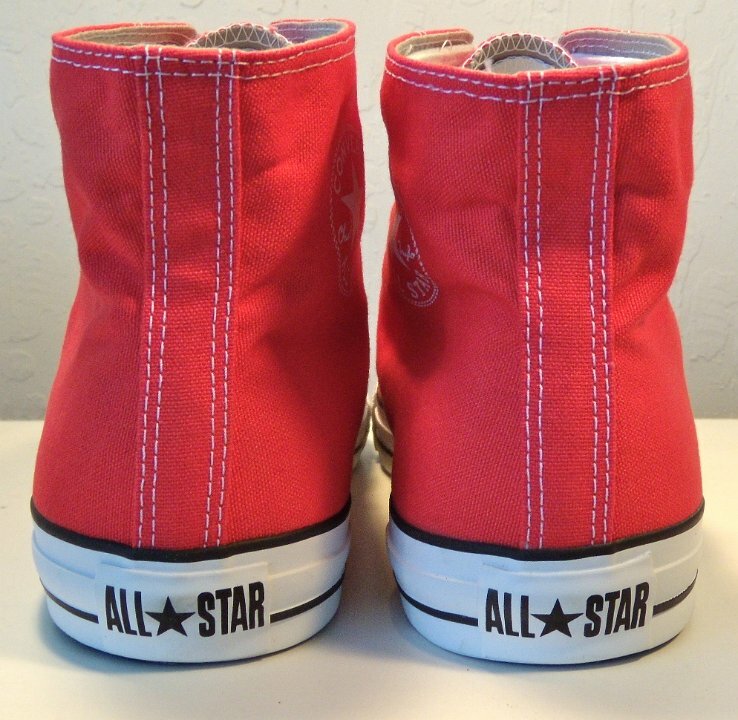 65 Foldover Double Upper High Top Chucks Inside patch views of folded down red foldover double upper high top chucks. 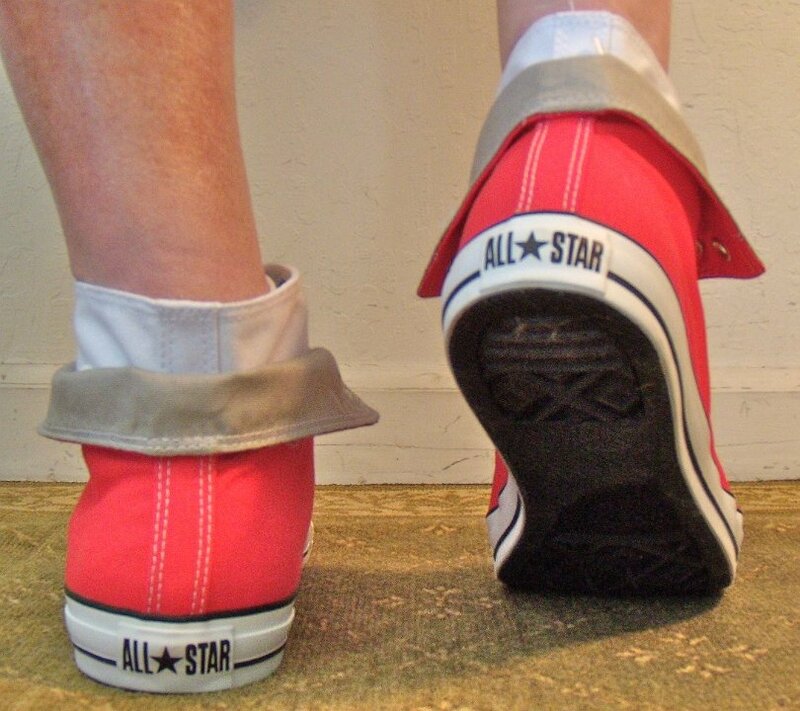 66 Foldover Double Upper High Top Chucks Outside views of folded down red foldover double upper high top chucks. 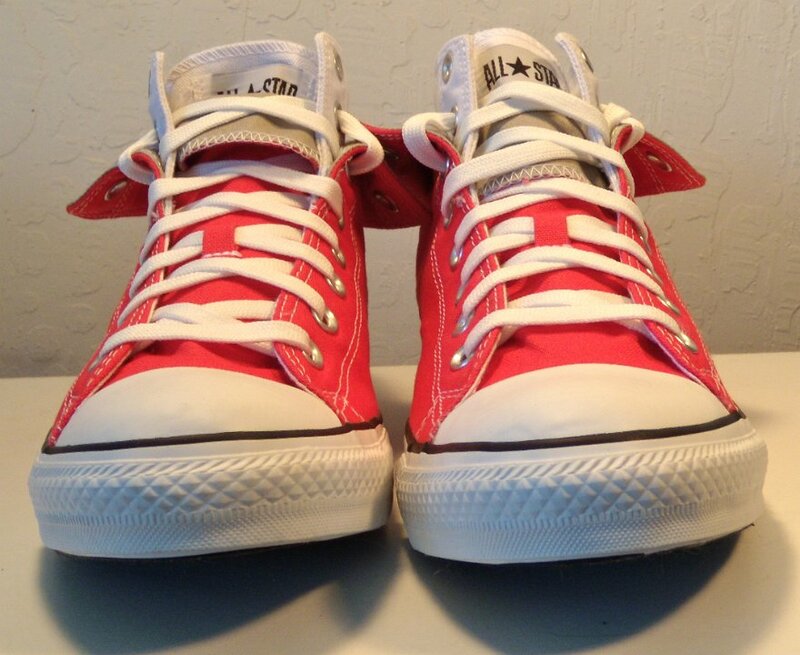 67 Foldover Double Upper High Top Chucks Inside patch and sole views of folded down red foldover double upper high top chucks. 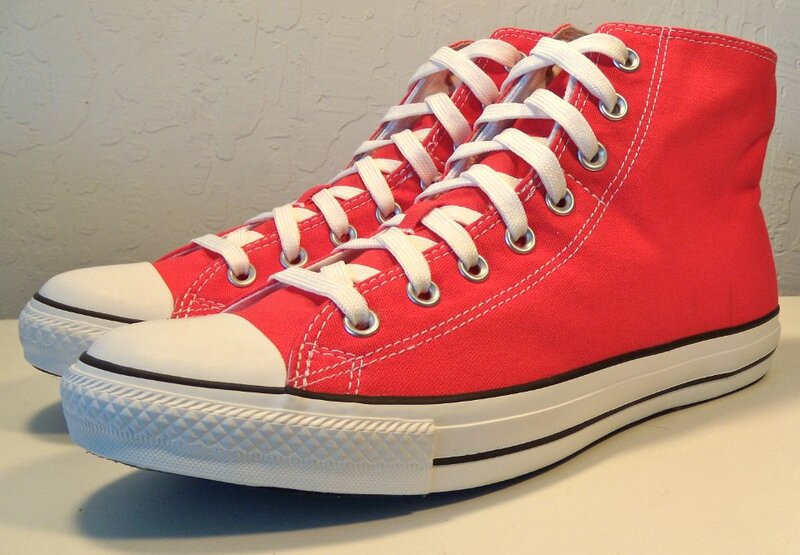 68 Foldover Double Upper High Top Chucks Wearing folded down red foldover double upper high top chucks, front view. 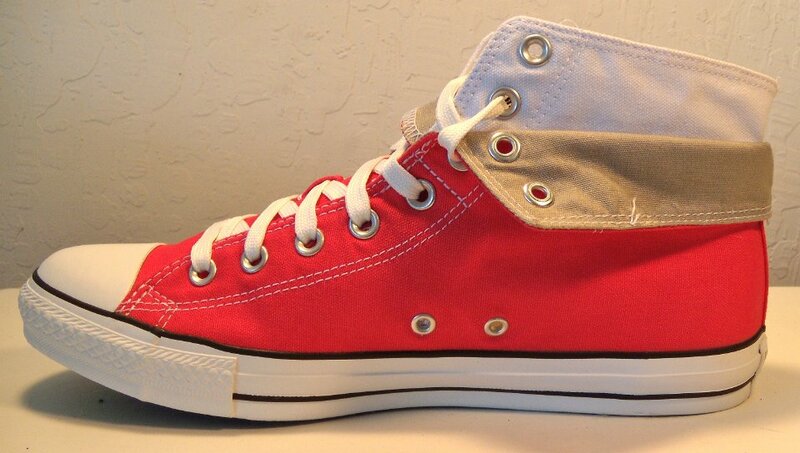 69 Foldover Double Upper High Top Chucks Wearing folded down red foldover double upper high top chucks, front view. 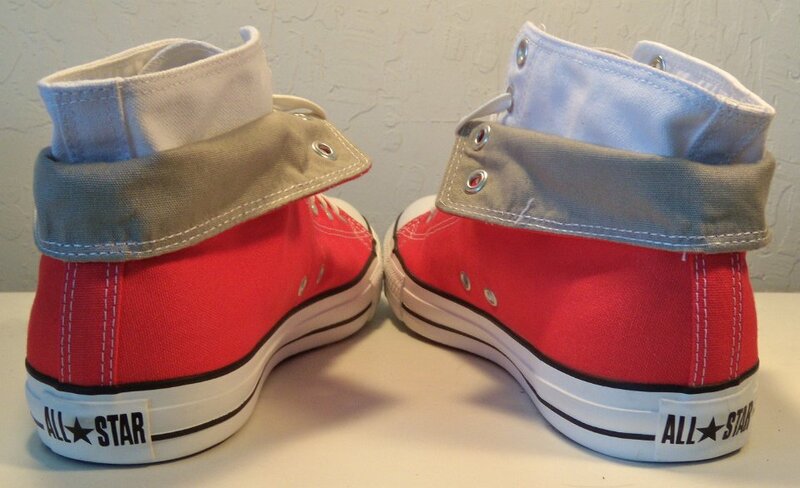 70 Foldover Double Upper High Top Chucks Wearing folded down red foldover double upper high top chucks, left side view. 71 Foldover Double Upper High Top Chucks Wearing folded down red foldover double upper high top chucks, rear view. 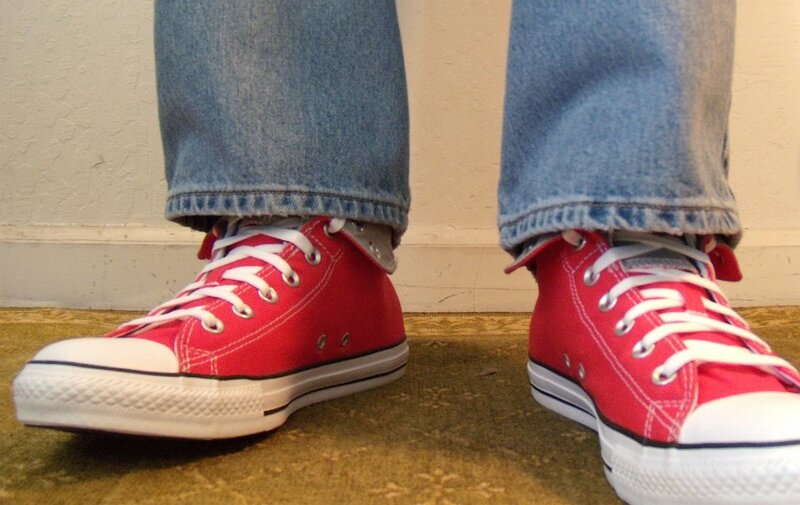 72 Foldover Double Upper High Top Chucks Wearing folded down red foldover double upper high top chucks with blue jeans, front view. 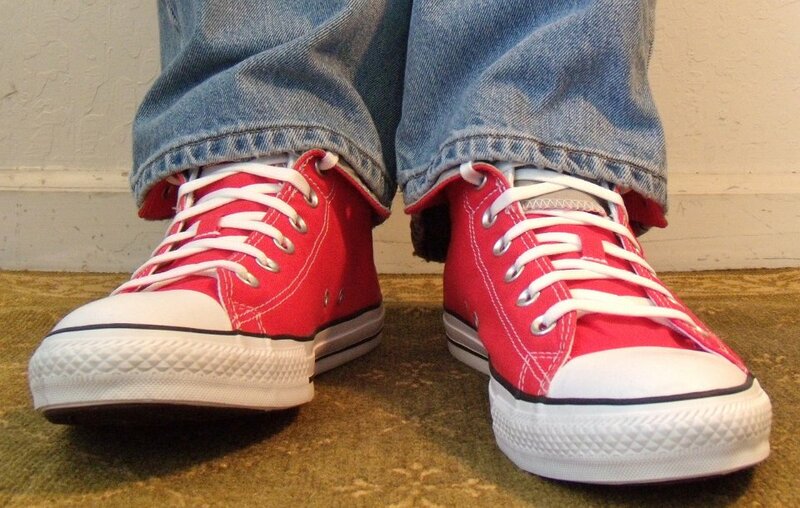 73 Foldover Double Upper High Top Chucks Wearing folded down red foldover double upper high top chucks with blue jeans, front view. 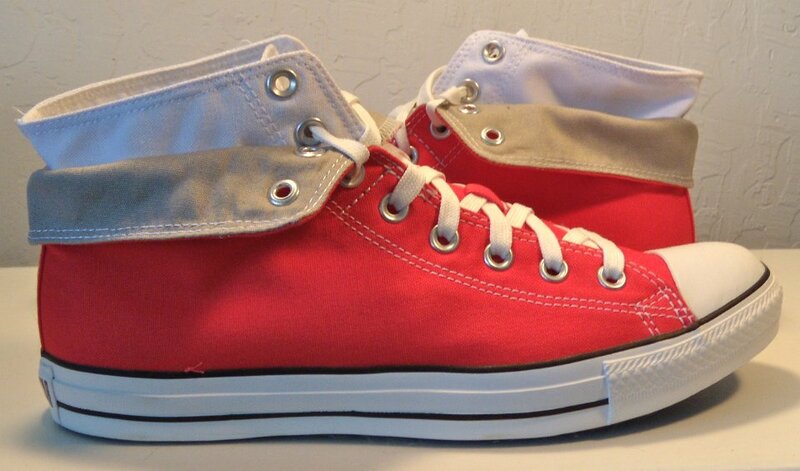 74 Foldover Double Upper High Top Chucks Wearing folded down red foldover double upper high top chucks with blue jeans, front view. 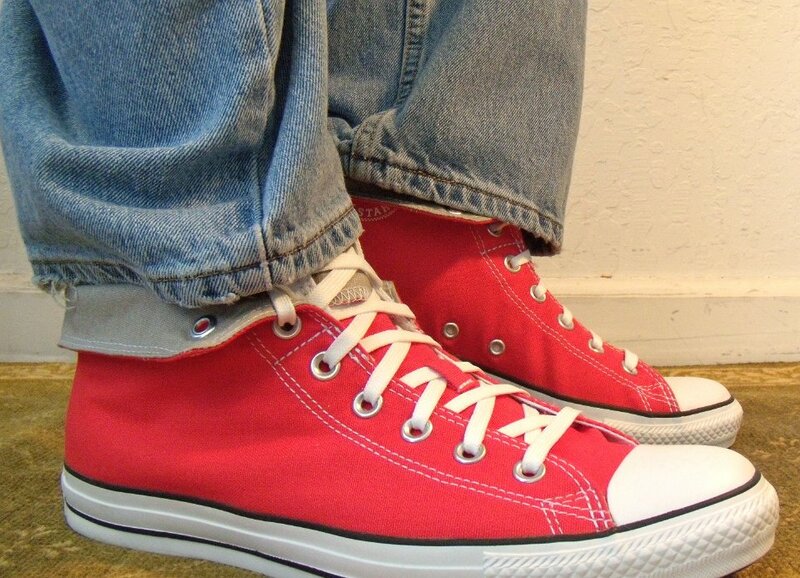 75 Foldover Double Upper High Top Chucks Wearing folded down red foldover double upper high top chucks with blue jeans, left side view. 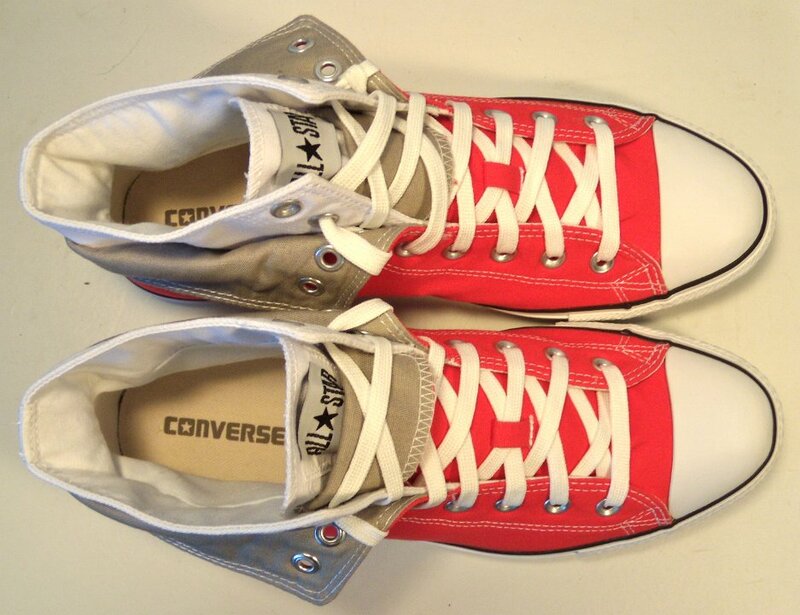 76 Foldover Double Upper High Top Chucks Wearing folded down red foldover double upper high top chucks with blue jeans, right side view. 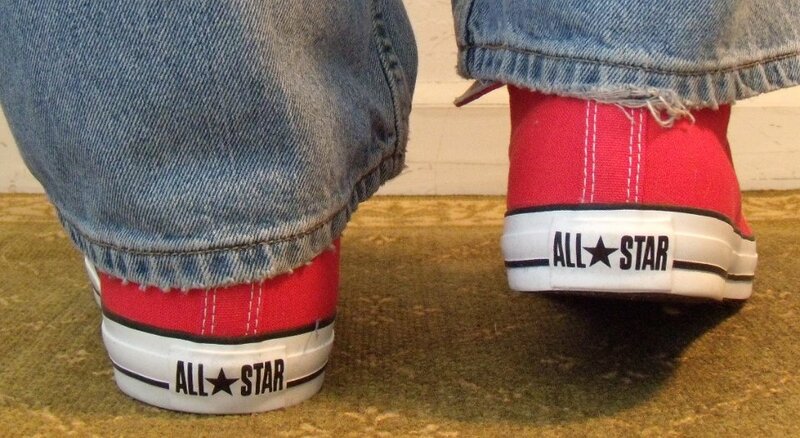 77 Foldover Double Upper High Top Chucks Wearing folded down red foldover double upper high top chucks with blue jeans, rear view. 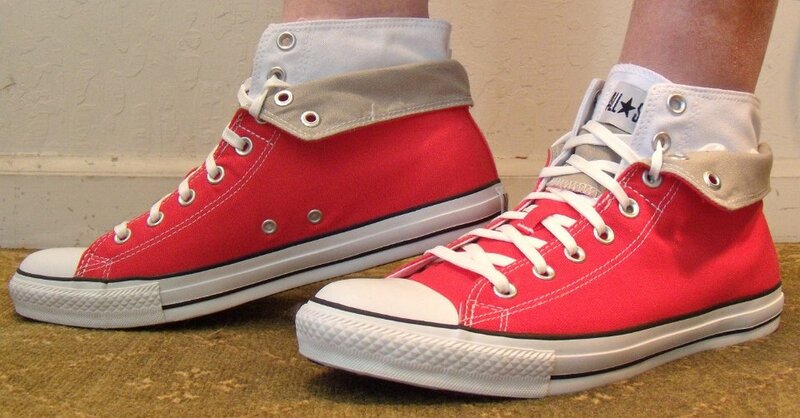 Foldover Double Upper High Tops in red/white and dress blue/gray color combinations are a seasonal model of chucks issued in the summer of 2012. The double upper design is somewhat different from other double upper models in several ways. 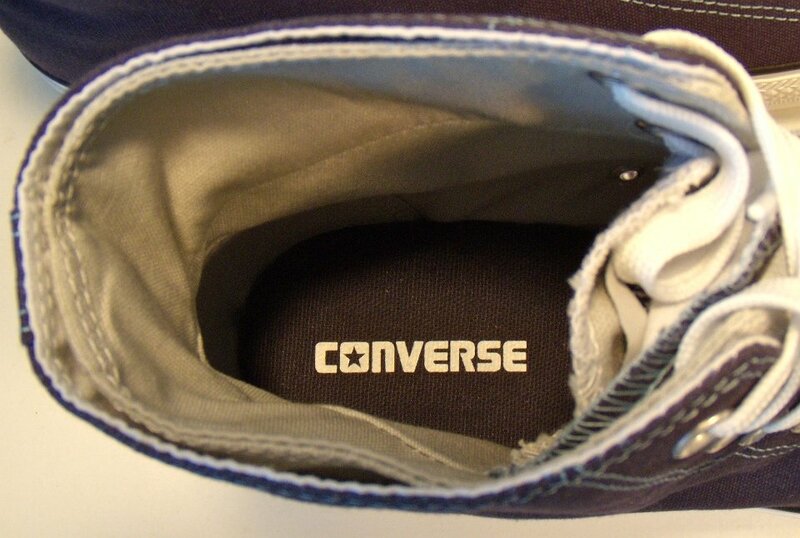 The inside Chuck Taylor ankle patch is printed in white onto the canvas instead of an actual patch sewn on. 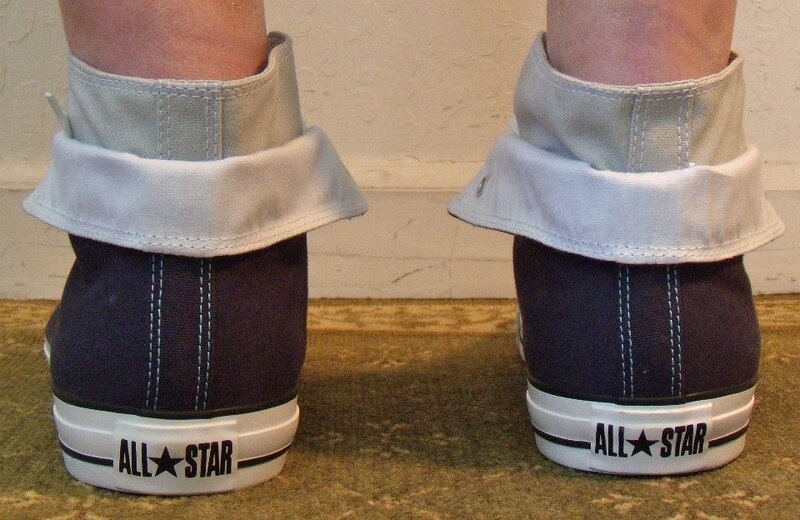 The ankle patch only appears on the outside upper. The All Star patch, which you normally see on low cut chucks is sewn onto the inner tongue, so that the upper tongue has to be folded over for the All Star patch to display. The uppers are glued together through the fifth pair of eyelets. 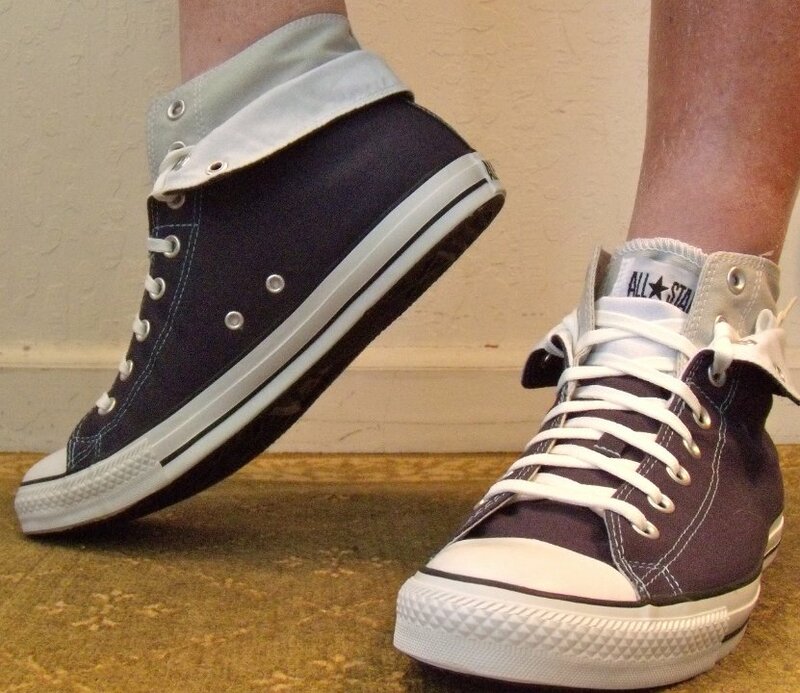 There is only one pair of shoelaces for the shoes. As with all double uppers the wearer has a number of lacing options. In the photos the shoes are displayed laced up and folded over. 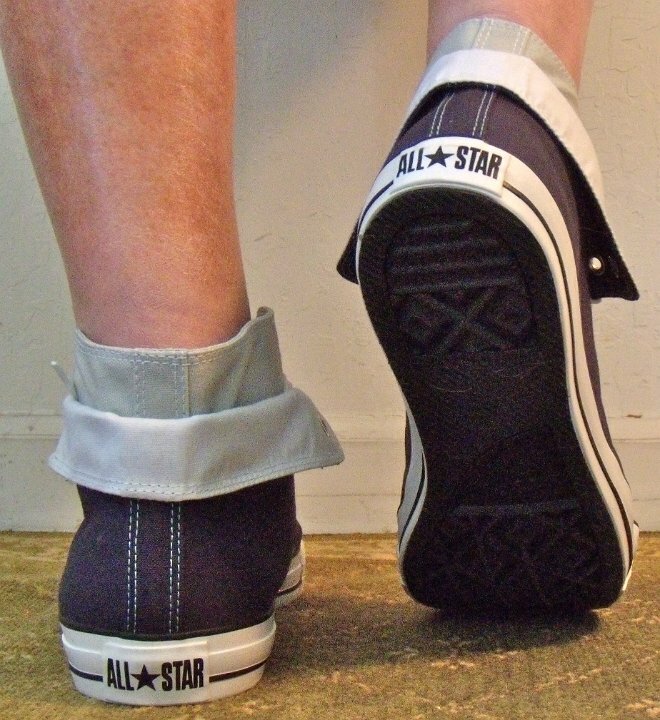 When wearing these chucks folded down, the laces don't need to be tied; they can be looped around and pushed into the slot between the two canvas uppers. 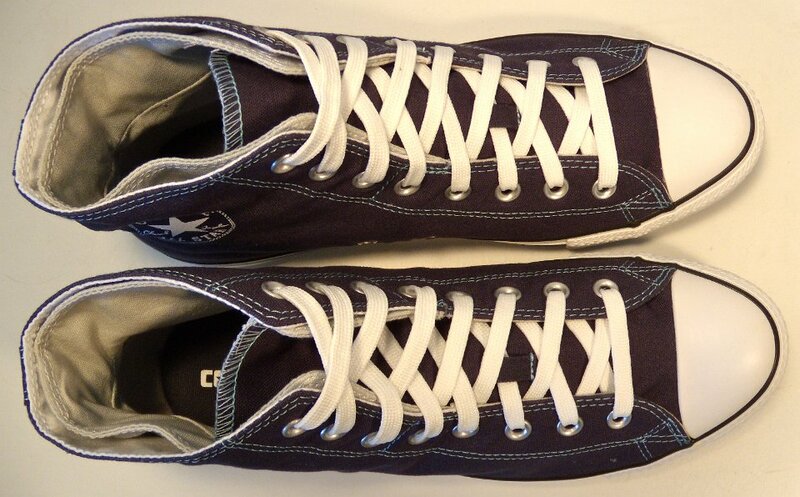 These sneakers appear to be designed mainly for wear with blue jeans, as shown in a few photos.